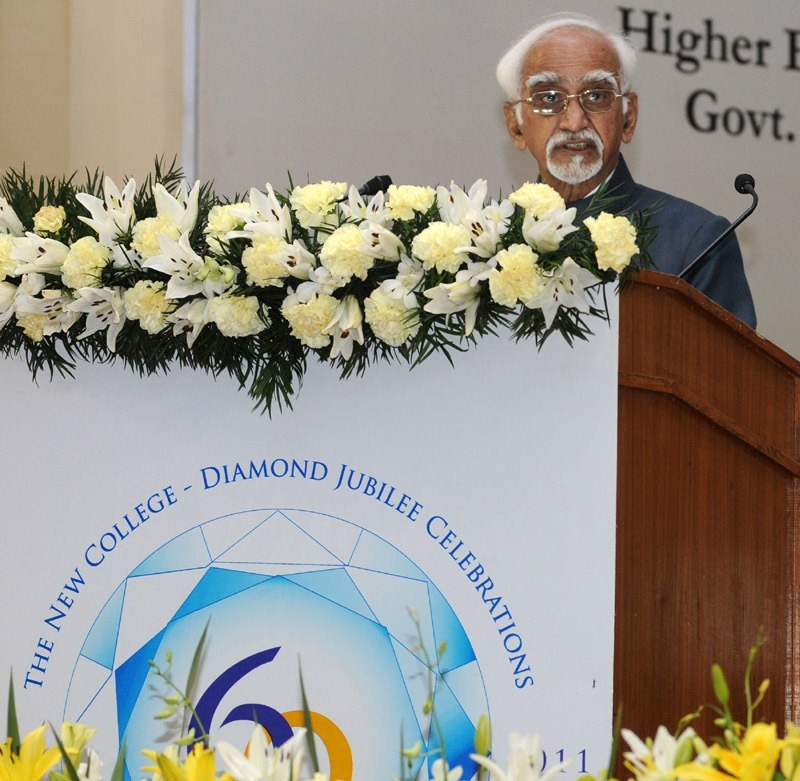 The Vice President of India Shri M. Hamid Ansari has said that as India marches ahead on the path of rapid economic growth and development, the imperative of inclusion of the minority communities in the development process cannot be overemphasized. Neither can the maintenance of social harmony and peaceful coexistence amongst various religious, ethnic and linguistic groups in our diverse society. Addressing at the “Inauguration of the Diamond Jubilee Celebrations of the New College, Chennai, Tamil Nadu” today, he has said that according to the 2001 census, recognised religious minorities comprise 18.4% of our population, which translates into approximately 185 million people. This number today could be around 220 million. If we include others who are claiming inclusion in this category, it could be said in general terms that every fifth Indian citizen belongs to a religious minority. The progress and well being of such a large segment of our population is a necessity to enable us to realize our destiny of becoming a modern, progressive and prosperous state. He expressed his concern that the re-emergence of communal tensions in some parts of the country is a cause for concern since it threatens our social fabric. It is essential that inclusive socio-economic development be accompanied by effective implementation of the constitutional provisions for the minorities. It is equally important to understand that the attainment of these goals on upliftment and welfare of minorities cannot be left alone to the governments, even though they do have the most important role to play. All sections of society have a responsibility in this process, including the minorities themselves. Gandhiji’s oft quoted dictum ‘be the change you wish to see in the world’ should be our mantra. The Vice President opined that the advancement and mainstreaming of backward segments of the minority communities, especially the Muslims is not a question of charity or welfare. It is an imperative for India to emerge as a modern, developed nation-state, with its minorities being fully mainstreamed in social, political and economic spheres. Change is underway; I have much hope from the younger generation in this regard.